Modena, 1852, 10c Black on Thick Brownish ("Camoscio") Paper Proof, complete sheet of 12, without gum as issued, wonderfully fresh, Extremely Fine, quite rare in this premium condition, illustrated on page 48 in 1852 MODENA 2002-150° anniversario dei francobolli estensi - VACCARI book; signed G. Bolafi, P. Vaccari and E. Diena in bottom margin, with 2016 Cardillo certificate. Scott No. 2. Sassone No. P3 €11,000 ($11,670). 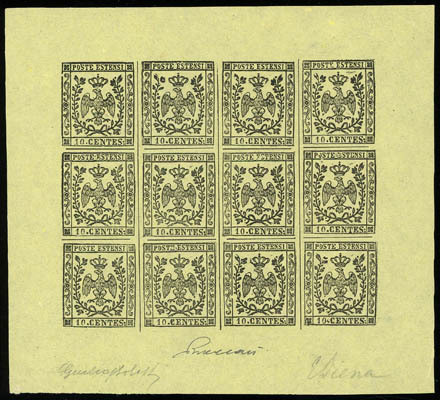 Modena, 1852, 10c Black on Thin Yellowish Paper Proof, complete sheet of 12, without gum as issued, exceptionally fresh, Extremely Fine, a true rarity in this superb condition, illustrated on page 47 in 1852 MODENA 2002-150° anniversario dei francobolli estensi - VACCARI book; signed G. Bolafi, P. Vaccari and E. Diena in bottom margin, with 2016 Cardillo certificate. Sassone No. P13 €11,000 ($11,670). 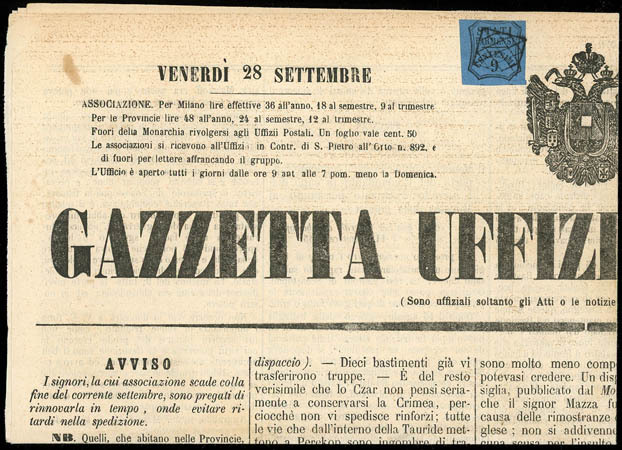 Modena, 1859 Provisional Govt. 15c Brown, o.g., lightly hinged, large evenly balanced margins, exceptionally fresh, Extremely Fine, choice and quite scarce with full original gum; signed A. Diena. Sassone No. 13. 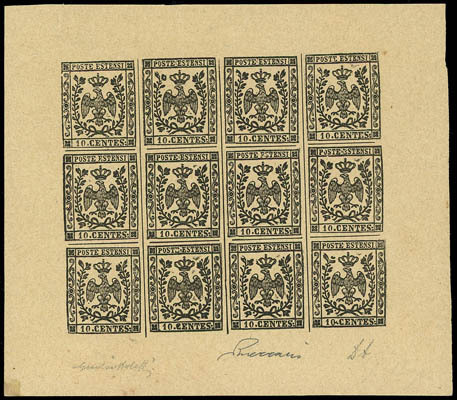 Parma, Newspaper Tax, 1857, 9c Black on Blue, margins large to a bit in at top, neatly tied by grilled Piacenza handstamp on complete newspaper sent from Milano to Piacenza, canceled upon arrival, Fine, an extremely rare usage; with photocopy of 2008 Sorani certificate. Sassone No. 2 €58,000 ($61,540). 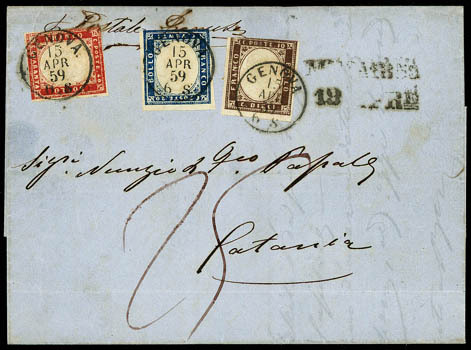 Sardinia, 1863, Newspaper, 1c Gray, horizontal pair, tied by two strikes of "Genova 10 Apr 65" cds on blue local cover, docketing also ties pair, Fine and scarce use. Scott No. P1 Estimate $150 - 200. Sardinia, 1851 Victor Emmanuel II 5c Gray Black, margins large to in at top, tied by neat squared diamond grid handstamp on locally addressed folded letter, matching "Chambery, 14 Oct, 52" cds, Very Fine; with 2016 P.F. certificate. Sassone No. 1 var. 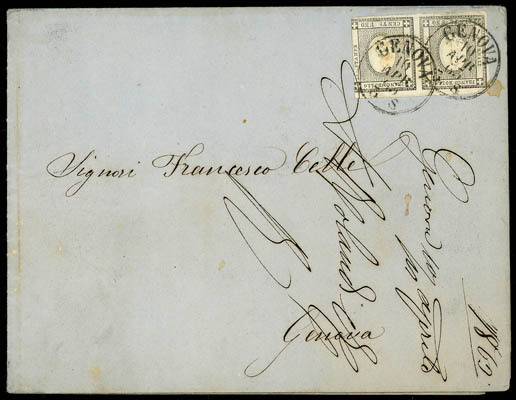 A RARE SINGLE FRANKING USAGE OF THE 1851 5C VICTOR EMMANUEL II ISSUE. Sardinia, 1854 Victor Emmanuel II 5c-40c Complete, Unissued, o.g. with 20c and 40c lightly hinged, large margins and rich colors, a Very Fine set, a very scarce set; signed, with 2003 Caffaz and 2004 Bianchi certificates. Sassone No. 10. 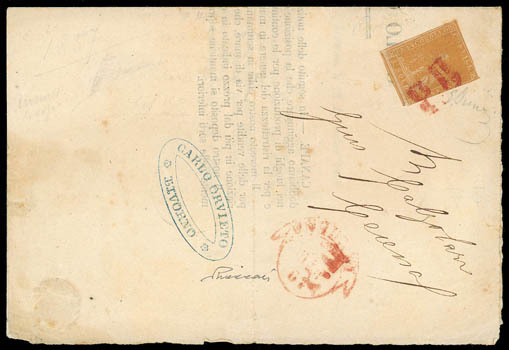 Sardinia, 1855-63 Victor Emmanuel II 10c Dark Brown, in combination with 1855-63 Victor Emmanuel II 20c Prussian blue + 40c vermilion on folded letter sheet to Catania, each tied by "Genova, 15 Apr, 59" cds, indistinct date stamp alongside, Very Fine, an attractive three-color franking. Scott No. 11j+12c+13d Estimate $200 - 300. Sardinia, 1855-63 Victor Emmanuel II 80c Yellow Ochre, in combination with 1855-63 Victor Emmanuel II 10c grayish brown + 20c indigo + 40¢ light red on cover to Callao, Peru, all tied by "Chiavari, 11Oct, 59" origin cds's, red Sardinia cds, reverse with Roma and "Paris A Calais" transit cds's; stamps with light creases except 20c, Very Fine appearance, a scarce usage to Peru; with 2016 P.F. certificate. Scott No. 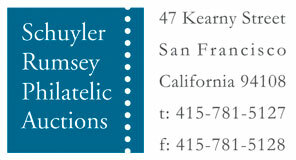 14b+11h+12d+13c Estimate $600 - 800. 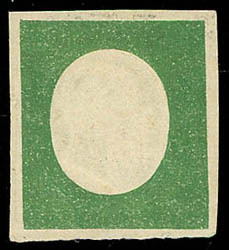 Tuscany, 1857, 1s Yellow, margins large to just in on two sides, tied by red "P.D." handstamp on 1858 preprinted circular to Cesena, red "Livorno 19.12.1858" origin townmark and reverse with superb strike of "Rocca S. Casciano 20 Dic. 1858" cds and arrival date stamp, Fine; with 2009 Vaccari certificate. Scott No. 11 $38,500. Sassone No. 11 €45,000 ($47,740). 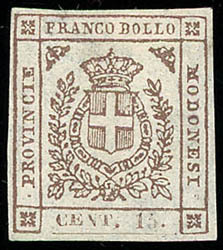 AN EXTREMELY RARE SOLO USAGE OF THE 1857 1S LION OF TUSCANY ISSUE.